I don't care what anyone (and particularly Phil) says: Command & Conquer: Renegade was a grossly underrated shooter. 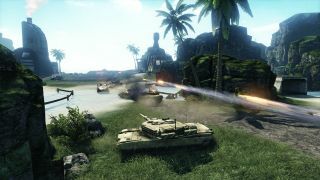 Fortunately, although a sequel seems (extremely) unlikely, there's still Renegade X, a fan-made, multiplayer "spiritual successor" that recently entered its fourth beta. Even better, the developers have also released the Renegade X SDK, a collection of tools that will enable the creation of custom levels, mutators, and mods. The fourth beta adds a number of significant new features and content to the game, including three new levels, smoke grenades, vehicle drops, vehicle kill messages, and an in-game jukebox. Building destruction has been changed, adjustments have been made to pawn and vehicle movements, there's a new vehicle locking system, and of course there are the mod tools, for which the developers have very high hopes. "With these mod tools, you will be able to create custom levels, mutators, and modifications for Renegade X. You will have full access to our assets, our source code, and the support and guidance of Totem Arts. We will do whatever we can to assist aspiring modders and level-designers to mentor and direct them accordingly," they wrote in the SDK announcement. "The release of these tools have great implications. Not only will Renegade X have a sizable fanbase, but in the future, we can develop a self-sufficient community that develops new, refreshing content. We hope to inspire a new generation of developers and support existing and emerging C&C FPS mods and games through this initiative." Naturally, a new beta demands a new trailer, and this one is a lot of fun: There's something about the blend of murderous violence and danceable beats that I just can't resist. (The music, by the way, is a remix of a track by the same name that appeared on the 1995 Music of Command & Conquer soundtrack.) The latest Renegade X beta, and the Renegade X SDK, can be downloaded from renegade-x.com.